The bilingual Nahuatl/Spanish text dates to about 1564 and was penned by Fray Bernardino de Sahagún. The work concerns itself with recording a series of debates between Mexican religious and political authorities and a team of twelve friars sent by the Spanish crown to attempt to destroy the indigenous faith. These verbal battles took place in the early 1520’s, shortly after the fall of the Aztec empire. While Sahagún didn’t reach Mexico until 1529 and thus was a few years too late to have witnessed these discussions himself, he did consult ten out of twelve of the friars, as well as four Mexica informants and four eminent native scholars (Antonio Valeriano, Alonso Vegeriano, Martin Jacobita, and Andres Leonardo), in order to reconstruct the debates (albeit in a highly-poetic and dramatic form). The lone surviving manuscript was lost for over three hundred years until it was rediscovered in the Vatican archives in the early twentieth century. Sadly, of the thirty chapters, only fourteen have endured the ravages of time. It received a German translation by Zelia Nuttall in the 1940’s, but remained untranslated into English until 1978, thanks to the effort of Jorge Klor de Alva (the first complete modern Spanish translation was executed by Miguel Leon-Portilla in 1977). Its first and only publication was in the final issue of Alcheringa: Ethnopoetics, Volume Four, Number Two, published by Boston University in 1980. This printing is the one I present you with today. Click HERE to access the downloadable PDF containing the Colloquies of the Twelve at Alcheringa’s online archive. I also recommend poking around in other volumes in Alcheringa’s archives, as they have quite a bit of interesting stuff back there, including more Mesoamerican research and several recordings of indigenous poetry recitations. Thumbs up to Boston University for releasing these archives to the public, including the audio recordings that came with issues of this journal. P.S. — As a bonus, this particular volume also includes several interesting Mayan legends I haven’t encountered anywhere else, and, related to my previous post, Thelma D. Sullivan’s full text translations of several birth/pregnancy huehuetlatolli speeches from Book 6 of the Florentine Codex. 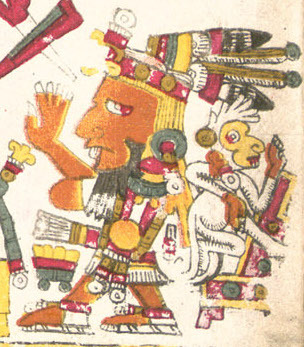 Book of the Colloquies; The Aztec-Spanish Dialogues of 1524. English edition translated and edited by Jorge Klor de Alva. Alcheringa/Ethnopoetics vol 4, no. 2:52—193. 1980. My dear grandfather passed away this month at 90 years of age, so in his honor I am going to post the entry about the grandfather from the Florentine Codex, as well as the related entry about the old man, as it expands on concepts discussed in the first one. Xolotl guide you, Grandpa. One’s grandfather is hardened, lean, white-haired, white-headed. He becomes impotent, childish. The good grandfather is an adviser, an indoctrinator. He reprimands one, beats one with nettles, teaches one prudence, discretion. The bad grandfather is negligent, of misspent days and nights; of no fame, of no renown. A luxurious old man, he is decrepit, senile. The revered old man, the aged man is white-haired, white-headed, hardened with age, aged, ancient, experienced, a successful worker. The good old man is famous, honored, an advisor, a reprehender, a castigator, a counselor, an indoctrinator. He tells, he relates ancient lore; he leads an exemplary life. The bad old man is a fabricator, a liar, a drunkard, a thief; decrepit, feeble; a gaudy old man, a luxurious old man, an old fool, a liar. He invents falsehoods.